The roman shades saga continues: On Monday last week I received the replacement roman shades from smithandnoble. After the last experience I knew I had to get them up as quickly as possible to see that they were in perfect condition, so I rushed out and bought four poles to hang them from. (The reason I had ordered from smithandnoble was they offered a ring top option so they could be hung from a metal rod and would be sleek and modern, rather than bulky and fussy. 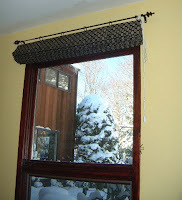 I sped back home with the selected black curtain poles and spent a good hour drilling holes in the wall to put them up. I thought I'd try the one in my study first and then do the den where there are three windows and I hoped Steve would take over with the drill. (It's man's work, you know). The blind looked ok coming out of the box, and on the pole there were no funny marks or pins left in the material, so far so good. Then I tried to lock the blind closed, and I pulled one way and then the other, then I checked the back and guess what? They had left off the locking mechanism. I could not believe it! I phoned them immediately and they promised a new blind, which they would confirm by phone within 48 hours, leaving a detailed voicemail if I wasn't home. Really? I'm still waiting for that phonecall, people, and FYI, four defective blinds out of eight is a really bad average. So this blind is one of those that will go in the den (and yes they are all ok, I checked). That won't be for a couple of weeks as an accident with a bagel has left Steve with four stitches in his left index finger and I'm too mad to tackle any window dressing right now.